Colm Feore before the madness descends. What makes a great production of Shakespeare great? Sometimes it can be less than you might imagine. The Stratford Festival's gripping King Lear, for instance, has no breakthrough concept (just a subtle angle on what counts as the standard interpretation), and its monarch presides over an utterly traditional set. And while it's richly appointed (see above), there are a few costuming tweaks that go wrong (Edmund is unconvincingly styled as an ascetic), and none of the stage imagery struck me as particularly memorable. Indeed, director Antoni Cimolino doesn't "do" anything in particular with the storm scene - nor is he tempted to pick at the braided identities of Cordelia and the Fool, or really any of the knotty fascinations of this grandly impacted text. What the production has (instead) is a quartet of great performances - and a fifth nearly-great one. Basically it's carried by its Lear, Gloucester, Fool, and Edgar, who are all superb - while its Kent is damn good. And you'll note this isn't even half the cast of the play. But it is very rare for any Shakespearean production - even a fine one - to breathe life into every great part that's available in the text. Indeed, watching two thirds of a cast reach greatness is like shooting the moon; seeing one that's brilliant across the board is like sighting a unicorn. The miracle is that for most of the major Shakespeares, a strong mini-ensemble within the larger ensemble is enough to guarantee a riveting evening (even with half the Bard's stunning material left, as it were, on the cutting room floor). Thus in Cimolino's Lear, I found myself pretty much ignoring all three of Lear's daughters (although Maev Baety, a new face at Stratford, showed potential as Goneril, at left). Cordelia made little impression at all, but the director at least had the idea to shape her wicked sisters as political schemers, bound somewhat sympathetically to an irascible and increasingly senile father. But while this got him to the storm scene, it couldn't get him past it; eventually Regan and Goneril must begin plucking out eyes and poisoning each other, and that level of evil has to come from somewhere deeper than the plot outline of House of Cards. Luckily, however, the core male performances often reached harrowing depths of Shakespearean feeling. Although you could argue that it was Scott Wentworth's Gloucester and Evan Buliung's Edgar who dove deepest into this most tragic of texts; I've rarely seen their desperate wanderings over the deserted heath rendered with more heartbroken simplicity. 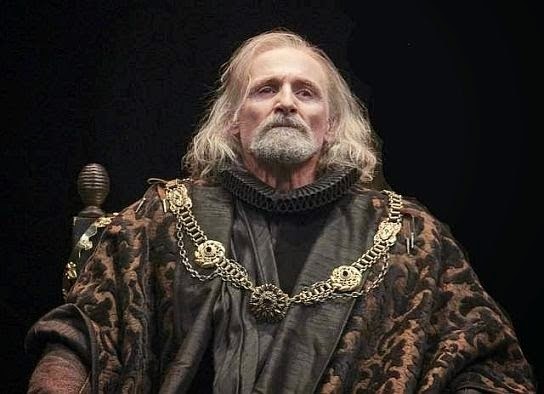 Meanwhile Colm Feore's performance drew its power not from Lear's self-destruction but rather from the glimpses he afforded himself of his own descent. Feore remains one of Stratford's most technically gifted performers; and so Cimolino's stress on Lear's cognitive decline afforded him several striking coups de théâtre, as his performance leapt from dazzling control to abject drift and stammer. Stephen Ouimette's memorable take on the Fool was, by way of contrast, almost mysterious in its means; indeed, Ouimette seemed to shrug off any and all attempt at comic display. Instead he underplayed everything, but with such quiet, unshowy confidence that the cumulative effect was devastating. It was the kind of performance that it can take an actor a lifetime to achieve - and which exists as the product of a whole tradition rather than a single production or vision; it would be wrong to call its placement here "accidental," but in the end its greatness was more a gift from the tradition to the production than the other way around. Which may be why it's also the kind of performance that's all but unknown in American Shakespeare. Hopefully the Canadian tradition, still so much more vibrant than our own, will continue to produce "accidentally" great productions like this one for a long time to come.